There is a critical need for greater awareness of – and practical support for – promoting healthy sleep for children, our experts told a Federal Parliamentary Inquiry into the issue. And sleep affects parents of children right across the age spectrum – from newborns to adolescents. The House of Representatives Standing Committee on Health, Aged Care and Sport inquiry into sleep health awareness in Australia is looking into whether Australians are getting enough sleep. Established by Federal Health Minister Greg Hunt, it is also considering the economic and social costs of inadequate sleep and sleep disorders. 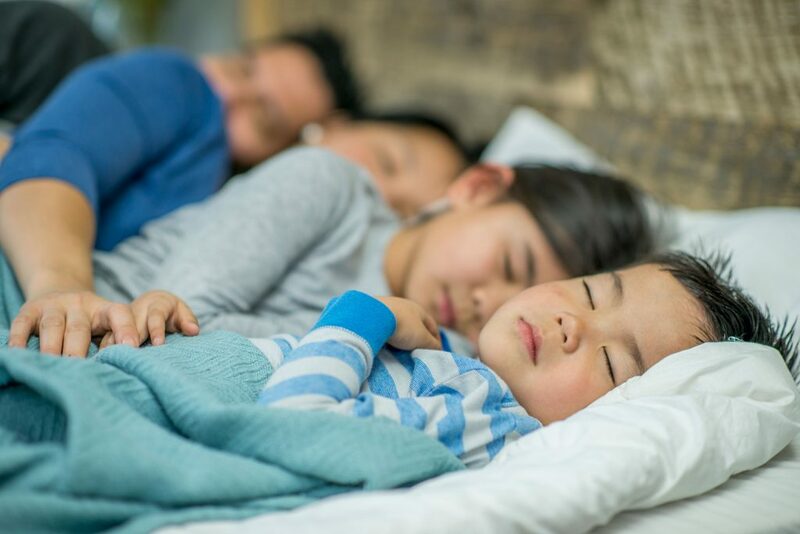 The Parenting Research Centre submission to the inquiry highlights the importance of parents knowing what good sleep habits look like for children and how to achieve them. Our Principal Specialist, Knowledge Translation, Derek McCormack, and raisingchildren.net.au Executive Director Associate Professor Julie Green, gave evidence to the Inquiry in February. They illustrated that child sleep problems were extremely common in Australia. Almost half of parents of infants and about a third of those with toddlers and preschoolers reported child sleep problems. This has significant impacts on children’s behaviour, mental health and school performance, as well as on their parents and families. Sleep problems persist in older children. For example, a third of parents of children aged 3–18 years report their sleep is a problem. Mr McCormack said there were strong links between sleep awareness, good sleep health and hygiene and overall wellbeing and positive family functioning. “High quality reliable, evidence-based parenting support is something that we believe is under-tapped in the area of sleep health awareness,” he said. Associate Professor Green said parents were eager for support on children’s sleep. For example, sleep consistently ranks among the most popular topics visited on the raisingchildren.net.au website. In 2018, people accessed two million pages of evidence-based information about sleep on the site. Likewise, digital/online support was influential in helping parents connect early with the sleep issue, she said. Also, it helped them “in the moment’ when they really needed it. Dr Green flagged options to the inquiry for promoting healthy sleep messages to busy parents to the Inquiry. These included embedding resources into the daily practices of those who work closely with families, such as GPs and child and family health nurses. The panel asked whether using electronic equipment affected child sleep issues. Associate Professor Green said there was evidence screen time before bed and in the bedroom contributed to poor sleep hygiene. This was the case among children in the upper primary and teenage years. In addition, our inquiry submission says much more can be done to increase awareness on sleep issues. This includes highlighting what constitutes good sleep habits across all stages of life for parents and children. Also, it includes highlighting connections between sleep health and mental health. It recommends further exploration and investment to provide practical support such as ready-to-use tools to track individual sleep health. Other supports include reliable, useable information via digital platforms and sleep experts to help parents and carers improve their own and their children’s sleep health.